Sweet and savory is one of my favorite flavor combinations ever. Grilled pineapple mixed with salty bacon, soy, and garlic is quite possibly one of the most delicious things. I also added a BBQ mayo which is literally two ingredients – BBQ sauce, and mayo. SO good and couldn’t be simpler! 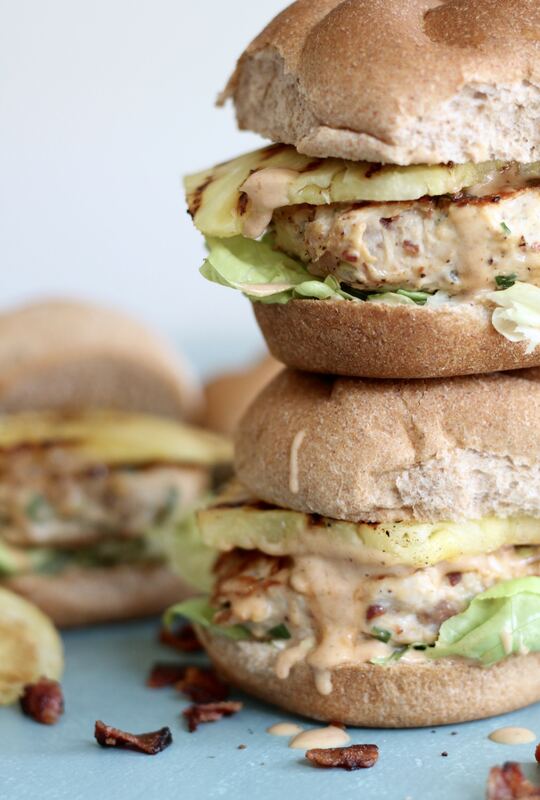 In my opinion, you can’t have too many burger recipes in the summer. They’re so fun to play around with. I LOVE this guac and pepper jack stuffed version I made earlier this summer. 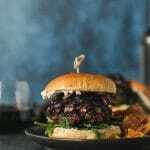 I mean, how can you go wrong with a guacamole piled burger STUFFED with gooey cheese? These require very few ingredients, but the ingredients pack quite the flavor punch. 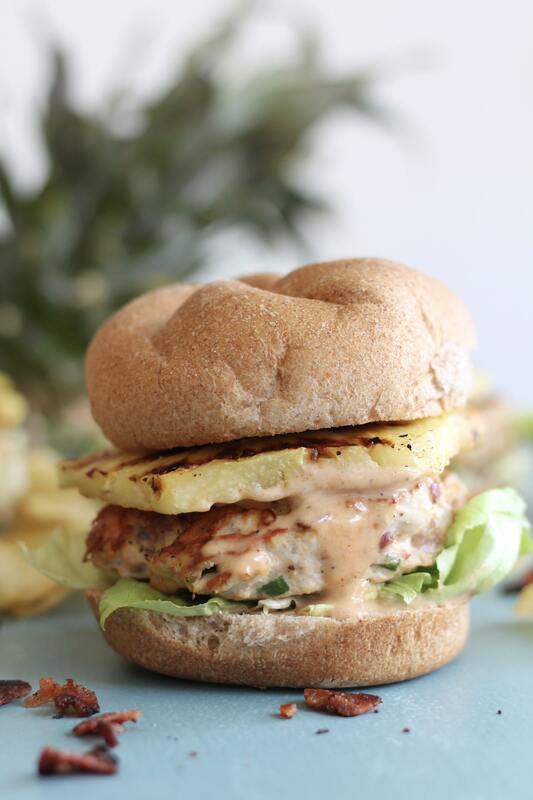 Ground chicken, bacon, scallions, garlic, soy, grilled pineapple, and BBQ mayo. Cannot get over it! I even ate them as leftovers a few days after without a bun, and they were equally as delicious. If you’re a sweet and savory fan like me, you will LOVE these. Since I live in a condo and don’t have an outdoor grill, I just used an indoor grill pan for the pineapple. If you have a real grill, yours will be even more delicious than mine! I sure miss having an outdoor grill. There’s nothing quite like the taste. That BBQ mayo just adds the cherry on top! Happy Friday all! 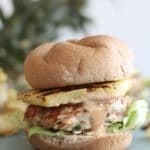 These grilled pineapple bacon chicken burgers are the perfect combination of sweet and savory, and they come together in just 30 minutes! Preheat your outdoor grill or grill pan to medium-high heat. 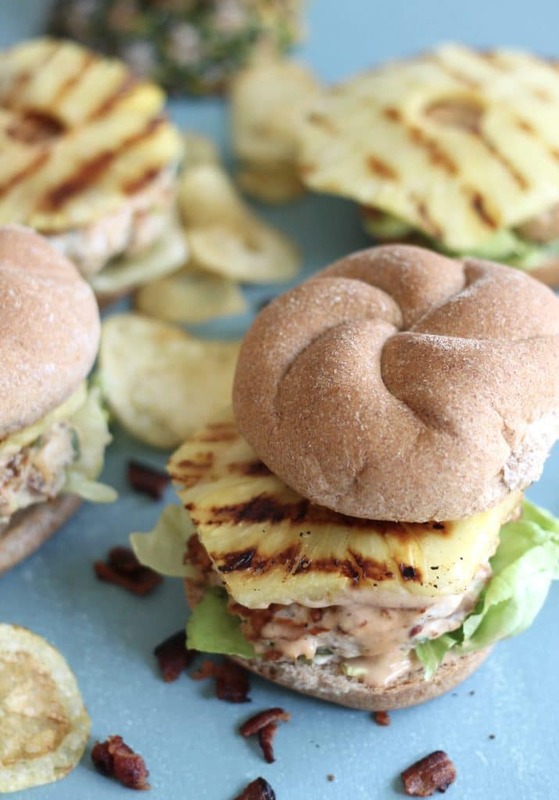 Grill the pineapple slices for 2-3 minutes per side, or until grill marks appear. Set aside. Combine the ground chicken, bacon, scallions, garlic, soy sauce, and pepper in a medium bowl. Mix until combined. 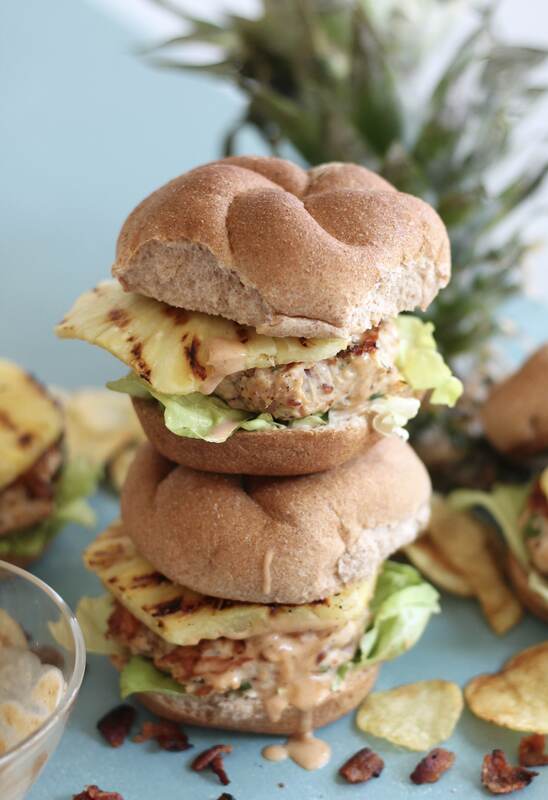 Form into 4 equal patties. Heat a large nonstick skillet to medium-high heat and add the olive oil. Add the burgers and cook for 3-4 minutes per side or until golden and cooked through. In a small bowl, combine the BBQ sauce and mayonnaise and stir until smooth. 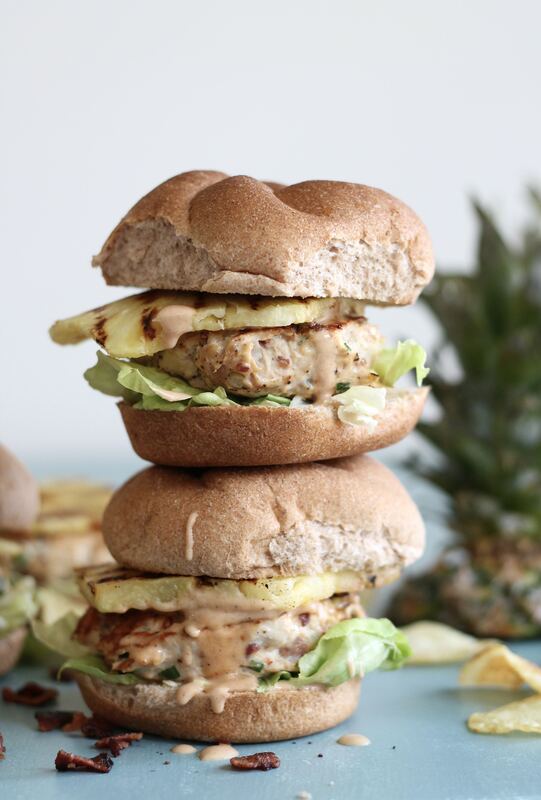 To assemble burgers, slather each side of the bun in BBQ mayo, then add butter lettuce, the burger, a grilled pineapple slice, and an extra drizzle of BBQ mayo!